The mystery of the hydrangea is solved. As soon as I saw the beige truck pull up late yesterday afternoon, it dawned on me. I should have realized who would have had the strength and necessary help to load and unload a giant hydrangea that weighed a ton. I can never tell a straight story, but I must set this up. One December, a well-known Atlanta garden designer gave me permission to hire two of her crew to do some major cleaning out around my then 95-yea-old mother's house. After they had finished, I showed them all around the farm (I remember a huge owl flew right in front of us as we were going down the lane to the shoals). They thought it was a wonderful place, even in winter. On the first Sunday in June, the two men appeared at my door, just as I was walking out to go to church. "May we plant a vegetable garden at the farm?," they asked. It was already late to be planting, but I said yes. The next thing I knew, a big swath of bottom land had been cleared, a deer fence erected and the ground plowed. Amazingly, there was a pretty good crop of squash, corn and tomatoes that year. They've since come every year, and now have two huge vegetable gardens. They've also planted lots of flowers and shrubs, which my mother would have loved. The great thing is they keep me supplied with Silver Queen corn, cucumbers, beans, tomatoes, peppers, squash, okra and fun things like peanuts. I had mentioned one time a couple of years ago that I thought Mother's hydrangea was in too much sun and that I wished I could have it at my house. I never thought about it again. This hydrangea had the most beautiful, dark purple blooms every year. One June, I took a bunch up to Tate, Georgia, where my husband is buried in his family's cemetery. Purple was his favorite color, and these were such big blooms that were almost jewel-tone. So, the two men had remembered that I wanted the hydrangea, so they dug it last weekend, put black soil around it - the kind you'd expect to see in a nursery quality plant - and brought it here. I didn't recognize it, because it looks so much bigger out of the ground. They obviously got all of the root system. Now the dilemma. Do I leave it out of the ground and see if it has dark purple blooms, or shall I plant it and see what happens? I'm thinking I might experiment and wait until fall to put it in a permanent place. 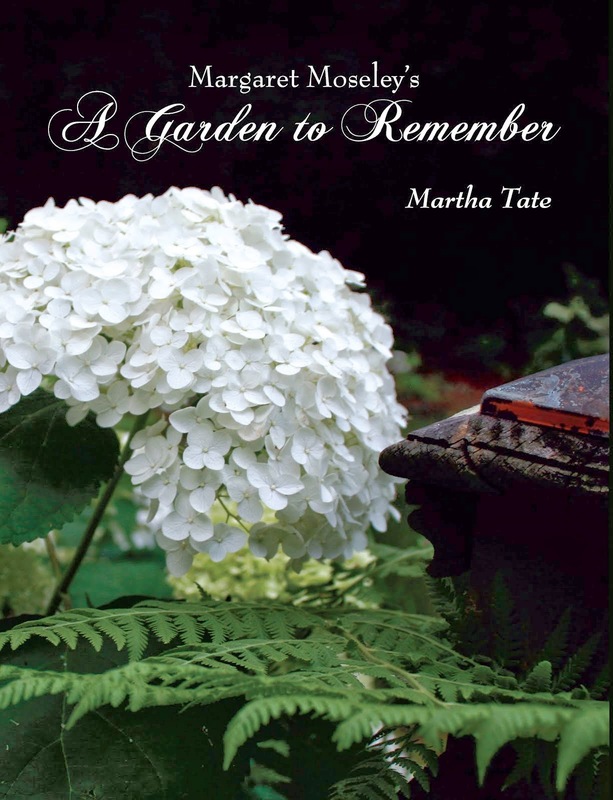 But what of the white hydrangea pictured above? This is Hydrangea macrophylla 'Margaret Moseley', shown in Margaret's garden. A local nurseryman saw it several years ago and asked to propagate it. A lot of lucky people bought the hydrangea. But then the nursery announced that it was closing. I made a frantic call and asked them to save ten plants for me. I called a few days later to say I was coming for them, and they told me the bad news. Someone had mistakenly sold my plants, and there weren't any left. I am going out to Margaret's on Friday (I'm glad to say she's improving and is laughing and joking again). I know where two of these hydrangeas are planted. I hope they are still there (Margaret moves things around so much; who knows?). If so, I happen to ride around with bricks in the trunk of my car, and I may try to pull down some branches to layer (a method of rooting by scraping a limb and making a dent in the soil and then holding it down with a heavy object; when it's rooted, it can be cut from the mother plant). At least three decades ago, Margaret bought this lovely white hydrangea at a small nursery that no longer exists. It was unmarked, and so far, no one has been able to identify it. It's not 'Sister Theresa', and it's not 'Mme. Emile Mouliere'. For the time being, it's H. macrophylla 'Margaret Moseley' until we know better. I just want to make sure I have one. It would look great next to my mother's beautiful plant. Thanks for the update on Margaret. I'm glad she is improving. I sent you a message a couple of months ago and asked if I could go with you to visit Margaret and her garden to which you replied "yes". Would it be possible for me to go with you on Friday or would it be better to wait until she is up and about? I live in Kennesaw and I could meet you and follow along in my car. I hope I'm not being too forward. Thanks for the update on Margaret. I'm glad she is improving. I sent you a message in Novemeber asking if I could go with you sometime to visit Margaret and her garden to which you replied "yes". Do you think I could tag along with you on Friday or would it be better to wait until Margaret is up and about? I hope I am not being too forward. That is a beautiful hydrangea. Perhaps you can put yours in a pot until you decide where to plant it? Does Margaret Moseley give tours of her gardens often? I'd love to get over to see it. What a story of these beauties. Also, thankful for Margaret's rebounding and especially "holding court". Love that. Good timing for the new session...errrr...season! Very sure we are glad you "can never tell a straight story". We enjoy those meandering pathway of yours. How great about the veggies!